Sports are so good for children, they help them exercise, usually without them even knowing that they are doing it and they can teach them so many valuable life lessons. With the obesity rate amongst children being so high and with the increased dominance of technology in their lives, it is essential that we encourage our children to take up a sport. I don't need to sell the benefits of cardiovascular exercise to you, we all know it's essential for good heart health and to beat obesity but let's run through the benefits to your child's education that come from participating in sports to really sell it to you. 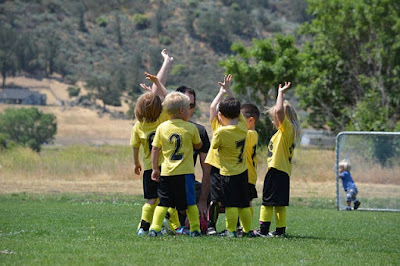 Sports teach children to participate in a society that can be competitive. Children can learn lessons about not giving up, even when things aren't going their way and that it is OK to lose sometimes, that it doesn't mean that they won't achieve what they want at some point. Life can be tough and sports help to coach children through that. I have a blog post on helping kids deal with problems if you need some extra guidance. Sports can help your child come to the realization that if they want something in this world they have to work hard for it. They are not going to be the best tennis player, for instance, if they don't work hard and practice and when they see that putting in the hours pays off it can set them up for life. They'll also need a good tennis racquet to succeed, you can take a look here at the best new tennis racquets. Disappointment is inevitable in life but success is measured by how quickly we can rise up from them and keep going. Disappointments will happen if your child plays sports, they might lose the tournament or come third in the dance championship but learning to lose will help them in the long run. I've already discussed the benefits of cardiovascular exercise but did you know that by being physically active children can improve other functions in their bodies. Physical activity, for instance, helps to build up motor skills and also gets connections between different parts of the brain going. It can also help improve posture and build up bones and muscles to prevent issues in later life. There is a range of benefits to being physically active. We can't go through life by ourselves, at some point we are going to have to work as part of a team to achieve something. There is no better way to learn to do this than by participating in a team sport. Your children will learn to communicate with team members, to follow through on actions that have been assigned to them and they will also work on organizational skills when they are thinking through strategies with their teammates. It's not just team games that can encourage these skills, however, sports such as dancing or swimming also have teamwork elements even if the ultimate results might be down to personal achievement.